UNLIKE ANY OTHER READING PROGRAM LEARN MORE! ESL help in nine languages! from Straight Talk About Reading, Susan L. Hall & Louisa C. Moats, Ed.D. try Read, Write & Type Online! To activate and use the audio ESL Help, please click on the “ESL” drop-down menu in the Start screen. Once the demo starts, you’ll see a yellow balloon at the lower right hand corner of the screen. As you are playing, you can click on the balloon at any time to have the instructions for the lesson repeated in the language you have chosen. for a free Sample Lesson which will give you an overview of the activities in Read, Write & Type. to let your child test drive the first 8 lessons FREE! Children learn to hear the individual sounds in words, and associate each sound with a letter and a fingerstroke on the keyboard. Children use their eyes, ears, mouths, and fingers. This multi-sensory and motor approachstimulates learning and helps children who have different learning styles. Children develop fluency by making thousands of letter-sound (phonics) associations. Children are engaged and motivated by the colorful characters, games, animations, and music. Based on extensive research and over 12 years of classroom testing, Read, Write & Type teaches children to write whatever they can say and read whatever they can write! Can be used in different learning situations – one-to-one, small groups, whole classrooms or computer labs. Includes downloadable Activity Book, stories & graphic images. Designed by the developer of Reader Rabbit, Read, Write & Type is packed with colorful characters who inhabit a fascinating world, filled with music and animation. RWT adventure takes place in a fantasy world inside the computer. A lively gang of storytellers (Ann the Ant, Bud, the Banjo Cass the Cat, etc.) live in two houses that look like the two halves of a keyboard. A mischievous computer virus called Vexor tries to steal the letters and prevent the storytellers from writing down their stories. Two Helping Hands, Lefty and Rightway, help children foil Vexor through 40 exciting levels, building hundreds of animated sentences and stories as they go. Children are rewarded with certificates of advancement after every four letters. Games at each level provide systematic instruction and practice with all 40 of the sounds in English words. Children learn to identify beginning, middle and ending sounds in words, blend sounds together, spell regular words, read, write, touch-type, and word-process. An E-mail Tower offers a word processor for writing original stories and sending simulated e-mail. A Power Fountain Game helps youngsters develop speed and accuracy in typing. The Spaceship Challenge provides extra instruction and assessment games, and tracks progress in these skills. Click here to take a quiz: How do children spell? TOUCH the letters on her keyboard, putting that code on paper. Kacey is using her mouth, ears, eyes, and fingers. Because she is engaging multiple senses, her young brain is stimulated to create powerful pathways for efficient and effective learning. Once these neural pathways are established, her brain and the computer can set up an interactive relationship. Her fingers “talk” to the computer, and the computer “talks” to her, leading her to the right responses when she makes an error. She will write a multitude of words and stories that are meaningful to her, reading as she writes. The Read, Write & Type has taken Kacey from speech to literacy! The young brain handles concrete concepts better than abstracts. RWT presents abstract concepts very concretely. For example, the keyboard is set up as two houses. 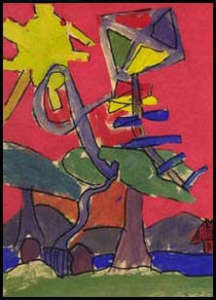 The abstract letters are made into concrete story characters like Ann the Ant, whose name and identity help children remember the sound of the letter. The brain works with feedback loops. For example, babies learning to talk, may say “ma”. Then Mom gives the feedback, “YES! MAMA!” Pretty soon, baby is saying “mama”. RWT provides clear, non-judgmental visual and auditory feedback. Children try to sound-out and spell words in phrases and stories. 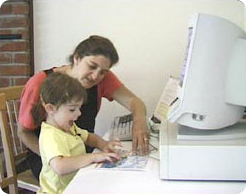 If they make a mistake, the program helps them by saying the sound, and showing them which finger to use and where to find the letter on the keyboard. The brain perceives patterns and generates rules about them. RWT uses regularly spelled words that follow the rules, and so establishes a strong pattern of letter-sound associations. The brain performs multiple tasks simultaneously (parallel distributed processing). Unlike other programs, RWT integrates phoneme awareness, phonics, reading, writing, spelling, and typing, all at once. Memory is enhanced by emotions. The storytellers associate sounds with emotion – Ann the Acrobatic Ant cries “aaaa” when she falls, and Issa says “iiiick” when she is disgusted. The story is emotionally engaging as children embark on an adventure to “save the letters” from Vexor. The brain develops fluency with practice. At first, learning is conscious and laborious, gradually becoming automatic. When the mechanics of writing or reading become unconscious, the cortex allocates more attention to the meaning of what is being written and read. Children need to connect 40 speech sounds with their letters to learn the alphabet code. In RWT, children sound-out and type hundreds of words. The more practice they have, the more automatic those associations become. Motor memory is a separate, very enduring brain system. Once we learn to ride a bike, we don’t forget. RWT uses motor memory. Simple keystrokes are linked to sounds and letters. As the fingers begin to learn their tasks automatically, children get into the fun of writing. The brain processes wholes AND parts simultaneously. Using RWT, children develop fluency with phonics (the parts) in a meaningful (whole language) context. In the process of reading, the brain decodes the parts (letters and words) and decodes the meaning of the whole (sentences). In the process of writing, the meaning is already known, but the brain must now both encode AND decode: Children encode the meaning (their story) into the alphabetic code (letters and words), AND decode (read the words and sentence back to themselves.) By taking a writing-to-read approach, RWT capitalizes on the fact that writing is a higher order brain function. In other words, writing uses more of the brain. Children are reading as they write, and writing as they read. Their brains are continually encoding and decoding. The design of Read, Write & Type is based on the best methods of reading instruction, and years of research in brain development. The program itself has been rigorously tested in elementary classrooms for over 10 years, and has produced significant reading improvement. RWT brings together the fundamental principles of reading instruction, with an emphasis on writing as a route to reading, in a program packed with visually exciting and engaging games and challenges. Prominent researchers, as well as our top teachers, report that the most effective reading instruction combines the best elements of whole language with those of phonics and phonemic awareness. In addition, the process of learning to read involves “breaking the alphabetic code”, that is, mastering the skills of both decoding the letters that make up words when reading, and encoding, putting together letters that make up words when writing. Reading methods that emphasize writing as a route to reading are powerful and revolutionary. And they are changing the way children learn. In a project funded by the National Institute for Child Health and Human Development, (NICHD), sixteen Spanish-speaking 6-7 year olds attended an after-school class for 60 hours using the Read, Write & Type. Their progress in reading was compared to that of 16 comparable controls who either went home after school, or attended day-care or after-school tutoring. All 32 students were struggling to read and were in the lowest 40% of the class on reading scores. The groups were randomly assigned. Their home language was Spanish, and their Quick English Start (QSE) scores classified them with Limited English Proficiency (LEP). Mean QSE scores for the RWT group were 62 and for the Control Group were 65. At this school, primary students were receiving instruction in English with support in Spanish. All the teachers were bilingual but used primarily English in class except for brief clarification in Spanish. Read, Write & Type (RWT), is a 40-level software adventure that provides instruction in phonemic awareness, phonics, spelling, reading, writing, typing, and word processing. The RWT Learning System provides systematic instruction in all 40 phonemes while children sound-out and spell hundreds of words, phrases, and engaging stories. A second CD monitors progress and takes students to appropriate practice if they are not quite ready to move to the next level. The RWT group received 60-70 hours of instruction and all 16 students finished the 40 levels of the program. Classes with two teachers and one aide ran for one hour every day after school, 5 days/week. They used the new version of Read, Write & Type which can be set to provide Help and Instructions in Spanish. Spanish Help is optional and can be accessed by clicking on a Yellow Balloon. Spanish Instructions are provided anytime new instructions are provided in English. (When students are introduced to a new phoneme, or new concept — for example, when they are told that names start with capital letters, and are shown how to use the shift key to make a capital — all the instructions are in both English and Spanish). Classes started with warm-ups on the floor. Teachers used the Read, Write & Type lesson plans to structure the warm-ups. Students were introduced to a new Storyteller character and the sound that Storyteller represents. They worked on naming pictures that they would encounter in the computer program.. They generated sentences with the picture words. They analyzed the beginning, middle or ending sound of the words. They thought of other words with the same beginning sound. They discussed new vocabulary words. They practiced using the correct fingers on the paper keyboards as they sounded out each phoneme (chanting aloud in unison) in dictated words or short phrases like FAT CAT or RED JET. 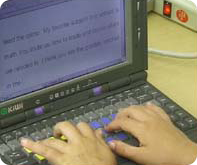 Then students spent about 30 minutes at the computer progressing through the 40 levels of the Read, Write & Type CD. After every 4 phonemes, they used the Spaceship Challenge CD to play games that assessed their progress in Phonics, Spelling, and Reading Comprehension. If their scores indicated that they were not ready to move to the next level, they clicked on the Bonus Blimp which took them automatically to activities they needed to practice before trying to pass the Spaceship games again. Students were tested before and after RWT with Woodcock-Johnson Word Attack (reading nonsense words) and Word Identification (reading words) in both Spanish (Munoz) and English. Data were analyzed using an analysis of covariance to see if the posttest scores were significantly different when the pretest on that measure was used as the covariate. The RWT group showed significantly greater improvement on the English Word Attack (p < .02) and English Word Identification (p< .01), suggesting that an after-school program using the Read, Write & Type can be very effective at improving reading scores significantly for LEP primary students who are struggling to read. Because students received no direct instruction in Spanish reading skills, a more surprising finding was that the RWT group also improved more on the Spanish Word Attack (p<.01), suggesting that the development of phonemic awareness and phonics skills in English may affect those skills in Spanish as well. Spanish uses the same alphabet and is more phonetically regular than English, although a number of the phonemes, particularly vowel sounds, are different. But learning to segment words into their component phonemes (phonemic awareness) is the same process in both languages and one of the critical steps to reading. Dr. Joseph Torgesen, Distinguished Research Professor, and National Reading Expert, conducted a study at Florida State University with a group of first graders. Identified as at-risk for reading failure, they were evaluated over a 2-year period in a program using Read, Write & Type. The children showed large gains in reading skills from pre to post-tests, with very large gains in fluency and accuracy. 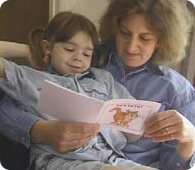 Reading comprehension scores were also higher than expected based on the children’s general verbal ability. Click here to read Dr. Torgesen’s report. In a classroom study conducted at Millard School in Fremont, California, 94 first graders received instruction using Read, Write & Type in two 1-hour sessions per week for a seven month period. The performance of these children was compared to that of 50 first graders from a comparable elementary school who started with higher reading levels than the students from Millard School. The Millard School children achieved significantly higher end of year scores on phoneme blending, reading nonwords, and spelling. 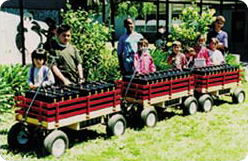 The Writing Wagon Project, carried out by Talking Fingers™ (CNS) and funded by the John S. and James L. Knight Foundation, delivered laptop computers for 56 hours (2 hours/week, November, 1996-June, 1997) to 94 first graders at Millard School in Fremont, California. Click here to see chart of results The 94 Millard first graders and a comparison group of 50 first graders at a nearby school were tested at the beginning and at the end of the project with the following tests: 1. Blending Phonemes, 2. Reading Nonwords, 3. Reading Words, 4. Elision, 5. Spelling. They were also tested at the end of the project with the following tests: 6. Woodcock-Johnson Word Attack, 7. Woodcock-Johnson Word Identification, 8. WRAT Spelling, 9. Typing. In summary, although the Comparison Group started out ahead on every test, the RWT Group scored significantly higher on Blending Phonemes, Reading Nonwords, and Spelling at the end of the project and made significantly greater improvement on all pre-post tests than the Comparison Group. They could find keys (keyboard and screen covered) with an average of 93% accuracy. 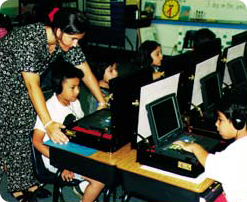 Students in a small Special Day class (including several autistic students) also used the computers twice/week. Although they were not tested, the teacher reports that students made noticeable progress in reading, writing, and typing. These students were highly motivated to use the computer and were more focused while working at the computer with headphones than they were during teacher instruction. Conclusions: The Read, Write & Type approach boosted first grade reading and spelling scores significantly. In addition, students acquired a foundation of computer skills that will make their work more and more efficient as they continue through elementary school. This research suggests that if this approach were implemented widely, it could make a significant improvement in reading scores across the nation. The Family Literacy Project, funded by the Knight Foundation, informally explored the effectiveness of Read, Write & Type with children and adults learning English as a second language. First and second graders used their new Read, Write & Type skills to help an adult family member learn English. 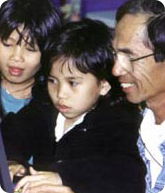 A group of Vietnamese families and a group of Hispanic families participated for two nights a week in four 6-week sessions. This project was not designed to collect formal data, but both the adults and children found it very enjoyable. There were waiting lists for each session. 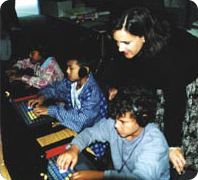 Talking Fingers (CNS) carried out an extensive research and development program from 1990 to 1993 with the Read, Write & Type prototype (called Talking Fingers) at Downer Elementary School in Richmond, California, and Springer Elementary School, in Los Altos, California. 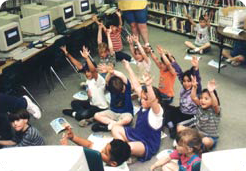 As a result, in 1993 Talking Fingers (CNS) collaborated with the Los Altos School District, in Los Altos, California, on a $550,000 project to set up Talking Fingers writing labs in all six elementary schools in the district and to evaluate their effectiveness. The Los Altos District has since upgraded to labs using Read, Write & Type, and in 1999 took first place in all of California in 4th grade reading achievement. In an article in Education Week (March 31, 1999), Jane Croom, a parent of two children from the original project, related a personal story: her 7th grade son, who began using the program in first grade, now writes extensively and types 100 words per minute. 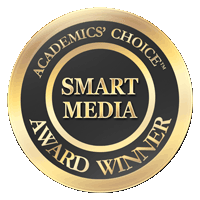 Click here to learn more about Talking Fingers, Inc.
Read, Write & Type wins The 2011 Old Schoolhouse Homeschool Crew Blue Ribbon Award for Favorite Reading Instruction Product! Good news! Read, Write & Type meets CLRN (California Learning Resource Network) review criteria. California Instructional Materials Funds can be used for the purchase of this product. Read, Write & Type was also successfully reviewed for Legal and Social Compliance and is listed in the CDE Legal Compliance Curriculum Catalog (LC Catalog). The California Learning Resource Network (CLRN) found Read, Write & Type to be in compliance with social content requirements of Education Code sections 60040-60044, and 60048, as well as State Board of Education guidelines which are outlined in the document, Standards for Evaluating Instructional Materials for Social Content (200 edition). "After 6 days my son David is up to level 7 and going strong. Reading and writing have always been great challenges for him, so it's great to see him touch-typing away. I think his reading aloud has improved substantially in the past 6 days. He has a clearer sense of when words end. His guesses are much truer to the sounds of the letters. And he seems more fluent, sounding out unfamiliar words more quickly." "Read, Write & Type is an excellent example of the very best in computer applications to provide support for children learning to read. The program not only incorporates the most important principles of beginning reading instruction, but it has also brought them together in a package that is very engaging for children. The great strength of Read, Write & Type is that it provides explicit and systematic instruction in reading and spelling strategies in the context of meaningful and engaging writing and reading activities." "My son was using a very expensive computer program at school, which, although good, was very boring and non-rewarding on a 6-year-old level. The new Read, Write & Type program not only helps him, it is fun, and he is asking on a regular basis to do one more letter. Thank you for gaining the interest of my son--and I am sure many children are like him--and for helping me teach him." "I am using RWT in my second grade bilingual classroom. All but four or five of my 17 students have finished RWT at least once. Your program exceeds all my expectations!!! They love it so much that they want to go through it again and again. The Spanish toggle is highly appreciated by the students who need it. They love the E-Mail Tower. One boy straight from Mexico, who knows (knew) no English, finished the program. I can't figure that out - How did he do it? This is ESL at its best. Thanks for making my job infinitely easier." "Among all the commercially available computer software claiming to offer reading instruction, we like Read, Write and Type the best." "It's amazing. Their little fingers can do it and they seem to enjoy it. At the end of first grade, 95% of the children can keyboard correctly and we've reviewed phonics." "In the Age of Computers, reading and writing have been joined by typing as the basic skills necessary for literary communications. Read, Write & Type should be called Read, Write & Type AND Entertain. This program has it all." Help Your Child Get a Head-Start in Just 15 Minutes a Day! We’ve all been told that children need lots of exposure to books and reading. What we haven’t been told, is that learning to read is not a natural process. It requires skillful, systematic instruction. It involves understanding that the words we speak are made up of individual speech sounds (phonemes), and that letters and pairs of letters are the symbols that represent the sounds. 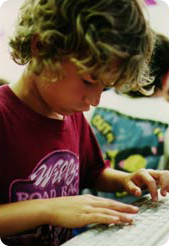 The Read, Write & Type provides this systematic instruction with engaging games and lively graphics. As children progress through the 40-lesson adventure, they become empowered to tackle the new words they encounter both in their reading and writing. But most of all, Read, Write & Type is fun and easy to use. You don’t need a teaching degree, just a computer and the time to watch your child’s confidence soar. How Much Do You Know about Learning to Read? Take a Quick Quiz and see things from a child’s perspective. Click here to view a video of students using Read, Write & Type. 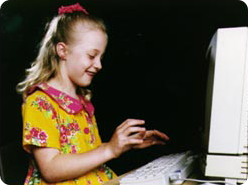 My Child Is Having Difficulty Learning to Read: How Can Read, Write & Type Help? Read, Write and Type… has clear auditory and visual instructions. The RWT is designed with many safety nets to meet the needs of children who may have difficulty reading and writing. The instructions are provided with clearly recorded speech; they do not have to be read. The auditory instructions are accompanied by graphic illustrations and can be repeated as many times as necessary. is non-judgemental and highly motivating. Children can learn phonics, reading, writing, typing, spelling and punctuation, at their own pace, with clear, non-judgemental feedback. Games can be repeated infinitely. Self-esteem is protected in vulnerable students who need to work at a slower pace and tend to make lots of errors. The program is highly motivating to keep the interest and concentration of children who have difficulty focusing their attention. makes reading easier. Children see words appear neatly spaced in a clear, large font, leading their eyes consistently from left to right on the screen. Writing requires reading — you really can’t write without reading what you write. The phonics children learn from writing in the RWT Learning System can be applied when encountering new words in books. makes writing easier. Research shows that dyslexics frequently have difficulty with visual-motor integration. The problem contributes to difficulty with handwriting as well (dysgraphia), because they have a hard time remembering the visual appearance of a letter and then drawing that letter with a pencil. (Is this a tall letter or a short letter? Do I start at the top or the bottom? Do I move the pencil from right to left or left to right?) Typing bypasses that difficult motor-visual process because it requires only a simple key press. RWT provides a concrete representation of the keyboard with houses and characters whose names start with the sound of the letter. This is much easier for LD children to remember than an abstract array of symbols. If children say the sounds aloud as they type each one, their mouths can literally “help each finger” — that is, it may be easier for children to mentally link a mouth motion and a finger motion (motor-motor) than a sound and a finger motion (auditory-motor). The simple act of speaking while writing engages multiple brain systems, and mobilizes maximum brain power for the task. The ESL language “toggle” in Read, Write & Type (access to another language) is an option available to the student at sign-in and allows for a spoken clarification of any of the program’s instructions in a student’s native language by simply clicking the “Yellow Balloon” on the screen. If a child is just beginning to learn about letters and sounds, do the Warm-Ups and lots of suggested games and activities. If a child already knows that letters stand for sounds and is starting to read and write, skip the Warm-Ups and jump right into the program! Sound words out together until the child does it independently. Provide lots of hugs and praise! Kids Love Read, Write & Type AND It Works! The Read, Write & Type is based on the most effective methods of reading instruction, and years of research in brain development. The program itself has been rigorously tested in elementary classrooms for over 10 years, producing significant improvements in reading. RWT brings together the fundamental principles of reading instruction, with an emphasis on writing as a route to reading, in a program packed with visually exciting and engaging games and challenges. 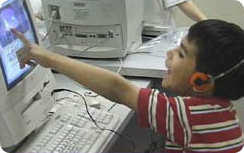 The Los Altos Unified School District in California, has been using RWT since 1991, at first testing the prototype (called Talking Fingers), and then upgrading to Read, Write & Type. In 1999, Los Altos achieved 1st place in the state of California for fourth grade reading scores! In the March 31, 1999 issue of Education Week, Jane Croom, a parent of two children from the original project , related a personal story: her 7th grade son, who began using the program in first grade, now writes extensively and types 100 words per minute. Does the Read, Write & Type Work for All Children? RWT is designed to help all young children master the essential skills of reading and writing. RWT also helps older children who are struggling with reading catch up with and exceed their grade level. Because RWT is multi-sensory, it accommodates children’s different learning styles, whether they learn best using their auditory, visual, tactile or motor skills. RWT also works well for children who are learning English as a second language. Click here to view a video of teachers talking about Read, Write & Type. My Student Is Having Difficulty Learning to Read: How Can Read, Write & Type Help? Read, Write and Type… has clear auditory and visual instructions. RWT is designed with many safety nets to meet the needs of children who may have difficulty reading and writing. The instructions are provided with clearly recorded speech; they do not have to be read. The auditory instructions are accompanied by graphic illustrations and can be repeated as many times as necessary. is non-judgemental and highly motivating. Children can learn phonics, reading, writing, typing, spelling and punctuation, at their own pace, with clear, non-judgemental feedback. Games can be repeated infinitely. Self-esteem is protected in vulnerable students who need to work at a slower pace and tend to make lots of errors. The program is highly motivating to keep the interest and concentration of children who have difficulty focusing their attention. makes reading easier. Children see words appear neatly spaced in a clear, large font, leading their eyes consistently from left to right on the screen. Writing requires reading — you really can’t write without reading what you write. The phonics children learn from writing in the RWT can be applied when encountering new words in books. makes writing easier. Research shows that dyslexics frequently have difficulty with visual-motor integration. The problem contributes to difficulty with handwriting as well (dysgraphia), because they have a hard time remembering the visual appearance of a letter and then drawing that letter with a pencil. (Is this a tall letter or a short letter? Do I start at the top or the bottom? Do I move the pencil from right to left or left to right?) Typing bypasses that difficult motor-visual process because it requires only a simple key press. RWT provides a concrete representation of the keyboard with houses and characters whose names start with the sound of the letter. This is much easier for LD children to remember than an abstract array of symbols. If children say the sounds aloud as they type each one, their mouths can literally “help each finger” — that is, it may be easier for children to mentally link a mouth motion and a finger motion (motor-motor) than a sound and a finger motion (auditory-motor). The simple act of speaking while writing engages multiple brain systems, and mobilizes maximum brain power for the task.